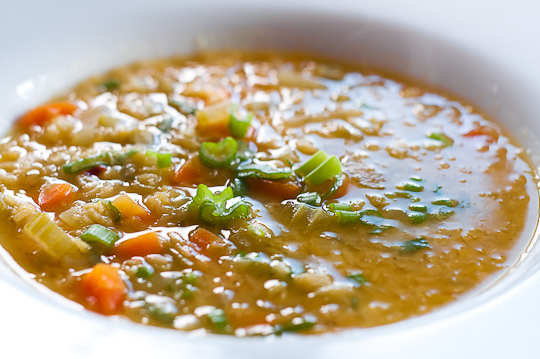 red lentils are great if there is not much time to cook – they need only about 15 minutes until tender. cut up celery stalks and carrots into small pieces. seperate green and white of green onions and chop. in a large pan, heat ghee. add garlic and the white of green onions, cook for two minutes. add carrots and celery, cook for another two minutes. add red lentils, cook fon one minute, stirring frequently. add chili flakes and vegetable stock and let it simmer until the lentils are done (15-20 minutes). right before the end of cooking time, add chopped green parts of the green onions (keep a bit for decoration). season the soup with lemon juice, soy sauce, black pepper and salt.